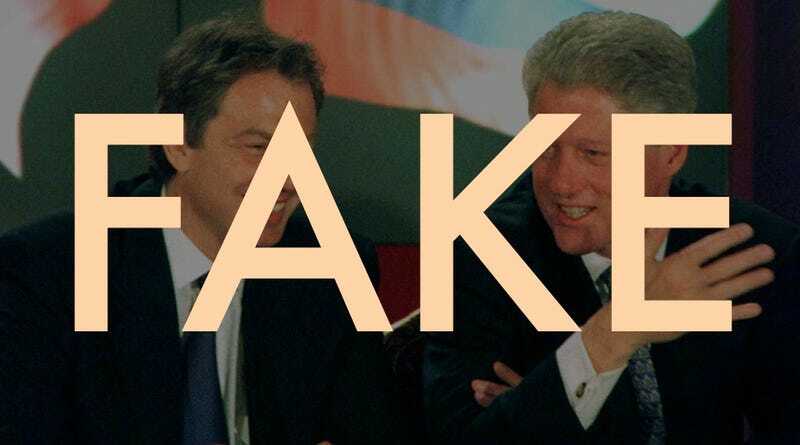 The Clinton Presidential Library recently released transcripts between President Bill Clinton and British Prime Minister Tony Blair dating back from the 1990s. The real conversations are candid and illuminating. But many transcripts that are being passed around on social media are fake. With bracing bluntness and a smattering of R-rated language, the private conversations reveal a president sometimes unseen by the general public, one who veered from wonky discussions of the Northern Ireland peace process to serrated assessments of his American political opposition. Like a time capsule, the transcripts capture the priorities and perceptions of the moment that, judged with the harsh certainty of hindsight, look prescient or wildly off base. And the transcripts are indeed fascinating. But Twitter comedian Michael Spicer has made his own parody transcripts. And while many of them are hilarious, they’re now starting to get passed around as real. Some Twitter users are proclaiming that the exchanges are so funny you could’t make them up. But that’s precisely what Spicer did. You can read the rest of Spicer’s fake transcripts over at his Tumblr page. But if you see people passing Spicer’s fake transcripts off as real, maybe send them a discreet note with a link to the real thing. As is often the case, the real thing can be even funnier than the parody. Update: One of Spicer’s fake transcripts involves the President punching a ham. But a spokesperson for Blair has confirmed to Buzzfeed News that “[Tony Blair] has never punched ham, nor any form of meat, meat-related products or substitutes with Bill Clinton.” Whether Clinton has ever punched a ham remains in question.